In addition to the Dallas World Aquarium, I visited the Perot Museum of Nature and Science during the course of SVP. The museum had made admission free for SVP attendees while the conference was going on, which was a treat. Being accustomed to the Smithsonian's National Museum of Natural History and the American Museum of Natural History, the Perot Museum's exhibit halls appeared much smaller in comparison. 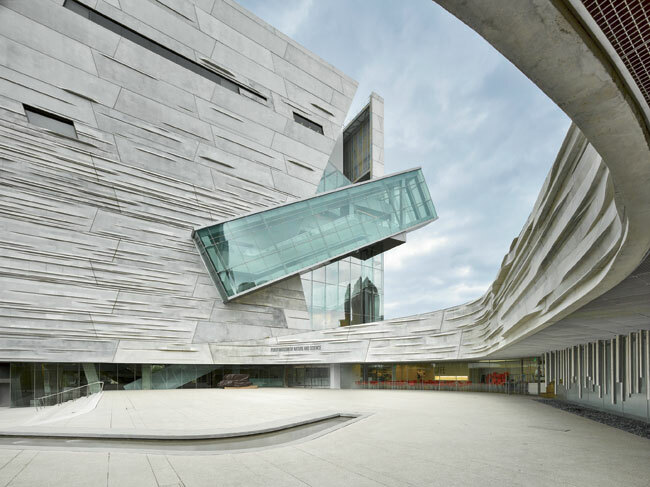 However, size does not translate to quality, and the Perot made good use of its space. On top of that, it is very architecturally interesting. The sign says Hypsilophodon, but this dinosaur will probably get its own genus. Tenontosaurus, without a Deinonychus in sight! They had a nice series of mosasaur mounts, including this Tylosaurus. In museums, Archelon and other large turtles can fly. ... and the skull of Gorgosaurus. So that's the way they're swinging. Hmm. Adult Edmontosaurus and juvenile Ugrunaaluk. Pachyrhinosaurus perotorum, whose trivial nomen shares the same namesake family as the museum. Skulls of Torosaurus and Styracosaurus. A flight of stairs leads to the museum's bird exhibits, which was nicely symbolic. They open with a display on avian evolution. There's Deinonychus! A life restoration of... Flexomornis? Interesting choice considering it is known only from fragmentary limb bones, but it all falls into place when one remembers that it was discovered in Texas. I don't buy the beak or the foldable tail fan. Hesperornis, among few marine dinosaurs of the Mesozoic. Representing modern birds is a pelican. I like how the alternative phylogenetic positions for Archaeopteryx are shown here. It hasn't turned up as a non-avialan in a while, but it was presumably still a hot topic when these exhibits were made. Though we didn't have time to explore the rest of the museum for long, getting to see the fossils was enough to satisfy me for the time being. On the whole, I had a great time in Dallas!